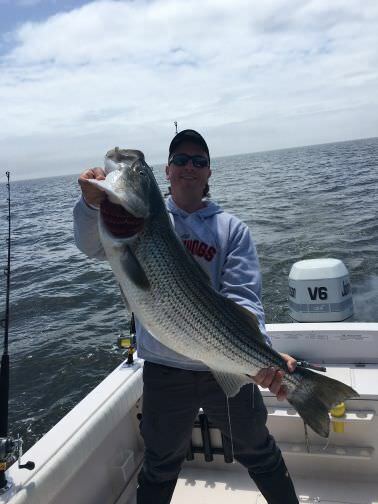 The first few days of Trophy Rockfish have been tough. I postponed 3 trips out a week or so due to poor fishing. Don’t feel right carrying people out when expectations are low. We did manage to land one yesterday, 43”. Hopefully the water warms up soon and gets these fish going! We got one today. Hope this isn’t a sign of things to come. Nice job! the only bad thing about catching a cooler full is cleaning them! Especially, when you are as slow as i am doing it. Nice! You did better than most, from what I’ve heard. Are you in the upper bay? Good on you for postponing some trips. With the warming water hopefully we will all get plenty in the coming 2 weeks. 42" in the box yesterday morning. It has been painfully slow, but it seems like it's picking up. My nephew caught this guppy. Recommendations for some fishing in Montgomery or Howard counties? I'm not a fisherman but my girlfriend used to go when she was little. I got her a rod last year but we have yet to use it, and want to change that. Also question, if I am attending but not taking a rod, do I still need a license?